I’ve found several good resources ideas on how parents can best help their children learn (including ideas on how to best respond to problems their children are having in school), and decided to bring them together in one post. 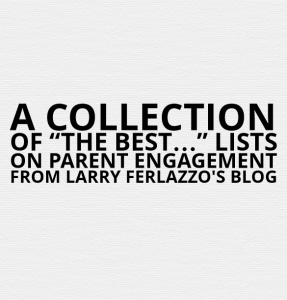 You can see all my parent engagement-related “The Best” lists here. Lorna Constantini has posted a link to a Livebinder of parent resources with activities that parents can do at home. Census: Parents Reading More With Their Children is a new Education Week article that includes useful research that teachers might want to with parents. It could be used to help parents see what are some good ways they could interact with their children to encourage learning. The Best Resources For Showing Students Why They Should Continue Their Academic Career. Ed Week’s Learning The Language blog recently posted information and links to a number of resources in English, Spanish, Hmong and Somali for parents with children who might have learning disabilities. I liked two in particular — one was on the physical effect that learning has on the brain, and the other was on failure (you might be interested in The Best Resources For Showing Students That They Make Their Brain Stronger By Learning and in The Best Posts, Articles & Videos About Learning From Mistakes & Failures). You can read more about the site at How Can Schools Best Communicate with Immigrant Parents? Teachers tell parents how to help their kids be better students is from The Washington Post and, even though I’d prefer if the headline wasn’t “teachers tell parents,” it still has some good information. Nice NY Times Article On Parent Involvement — On Their Fashion Page! is a post I wrote summarizing a good Times article. 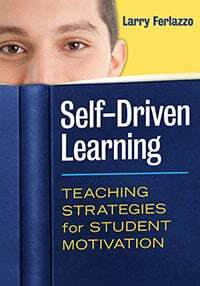 The Pajarao Valley Unified School District has an excellent collection of resources on Professor Carol Dweck’s work, and it’s been on The Best Resources On Helping Our Students Develop A “Growth Mindset” list for quite awhile. However, they created another related resource that, for some reason, I discovered is not on that list. It’s an exceptional PowerPoint presentation on how to provide feedback to students that promotes a growth mindset. And, in an added bonus, a portion of it speaks directly to parents. How Parents can help their Child with Homework offers mostly good advice. It’s from a newspaper in Tennessee. What’s Best for Kids? Tips for Parents is a very good short collection of advice from the Association for Middle Level Education. My advice to parents is featured in USA Weekend, the Sunday Magazine carried by many newspapers across the country. • Avoid using rewards and punishments for academic work. If you give your child a dollar for every book he reads, it’s less likely he will want to read books for pleasure after you stop paying him. The entire article is worth reading and, perhaps, with parents. 9 complaints schools hear from parents: What you should do when something goes wrong is by Jay Mathews at The Washington Post, and contains a lot of useful advice for parents. Parents: 19 Meaningful Questions You Should Ask Your Child’s Teacher is a good post over at Edutopia. 20 Questions to Ask During a Parent-Teacher Conference offers some pretty good suggestions for parents. What Kids Learn From Hearing Family Stories is a very interesting article in The Atlantic about the value of — in addition to reading books with their children — parents telling children about family stories. Over the last 25 years, a small canon of research on family storytelling shows that when parents share more family stories with their children—especially when they tell those stories in a detailed and responsive way—their children benefit in a host of ways…. Children of the parents who learned new ways to reminisce also demonstrate better understanding of other people’s thoughts and emotions. These advanced narrative and emotional skills serve children well in the school years when reading complex material and learning to get along with others. In the preteen years, children whose families collaboratively discuss everyday events and family history more often have higher self-esteem and stronger self-concepts. And adolescents with a stronger knowledge of family history have more robust identities, better coping skills, and lower rates of depression and anxiety. Parent Involvement in Early Literacy is an Edutopia blog post offering a number of useful suggestions to parents of young children. Cleveland Administrator Launches College Tours for Parents is the title of a pretty interesting Education Week article. It describes the work of the leader of parent engagement for the Cleveland school district. 12 Ways Parents Can Help Their Kids Succeed At School is an article at The Huffington Post. You probably won’t find anything new there, but it does have some useful links to research. ← The Best Resources On Parent Engagement In Countries Other Than The U.S.
One very simple thing parents can do at home is turn on the captions whenever their kids are watching TV. Research shows that it can significantly boost a variety of reading skills! For more info, check out http://captionsforliteracy.org .